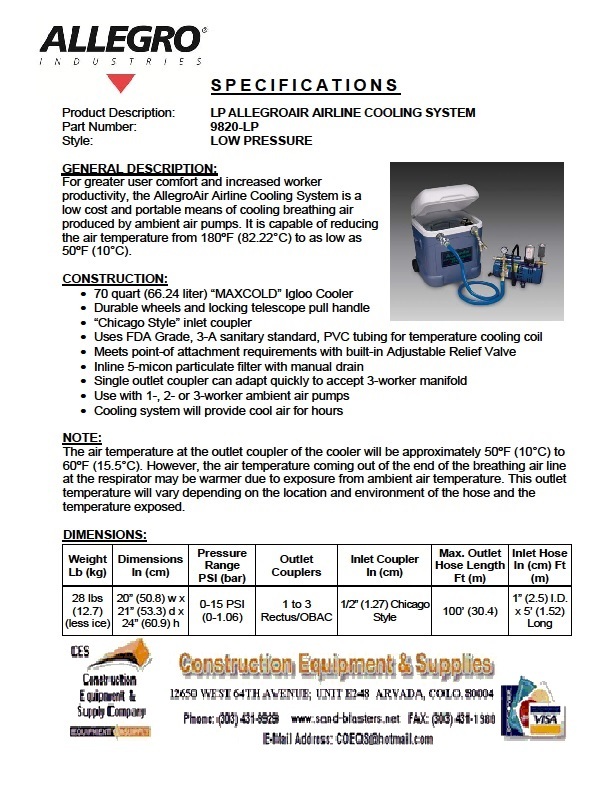 ALLEGRO Model 9820-LP Low Pressure Airline Cooling System Is A Perfect, Low Cost & Portable Means Of Cooling Breathing Air While Keeping Workers Comfortable & Productive For Hours. 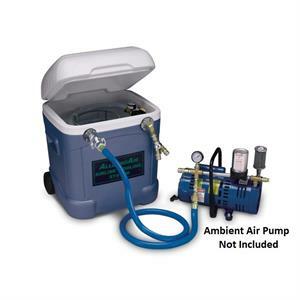 The System Is Capable Of Reducing The Air Temperature From 180° F To As Low As 50° F. The Cooling System Is Connected To The Ambient Air Pump Through A 5′ Long Inlet Supply Airline Using A Heavy Duty “Chicago Style” Coupler. 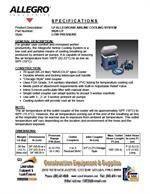 Air Flowing Through The FDA Grade PVC Temperature Cooling Coil Inside The 70 Quart Cooler Reduces The Air Temperature By Having Ice Poured Onto & Around The Coil. Coils Are Separated To Allow Ice To Surround Hose. The Outlet Air Is Filtered At The End Of The Coil Line By A 5 Micron Particulate Air Filter, Which Removes Condensation That May Build Up In The Hose. 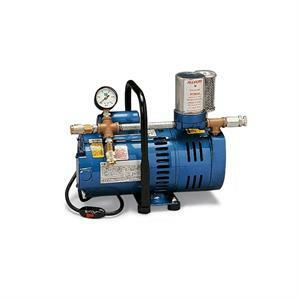 An Adjustable Relief Valve Allows The User To Adjust The Air Flow. 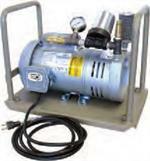 Single Outlet Coupler Can Adapt To 3-Worker Manifold & Can Be Used With Up To 3-Worker Ambient Air Pump. Transportation Is Made Easy With Durable Wheels & A Locking Telescoping Pull Handle. The ALLEGRO Model 9820-LP Low Pressure Airline Cooling System Offers Greater User Comfort & Increased Worker Productivity, The AllegroAir Airline Cooling System Is A Low Cost & Portable Means Of Cooling Breathing Air Produced By Ambient Air Pumps. 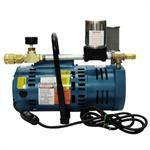 It Is Capable Of Reducing The Air Temperature From 180ºF (82.22°C) To As Low As 50ºF (10°C). The air temperature at the outlet coupler of the cooler will be approximately 50ºF (10°C) to 60ºF (15.5°C). However, the air temperature coming out of the end of the breathing air line at the respirator may be warmer due to exposure from ambient air temperature. This outlet temperature will vary depending on the location and environment of the hose and the temperature exposed.